Virtual reality goes beyond reality! Why does it work in real life if it's virtual? It may be surprising to learn that facing our fears in virtual reality can really help in real life. The explanation rests on how the brain works: Have you ever been afraid suddenly or thought you saw or heard an intruder? Did it make you fear the worst and shudder for no reason? No need to suffer from an anxiety disorder feel that! In highly stressful situations, emotions (like fear) and physical sensations overcome us to the point that we can no longer think rationally… whether the situation is real or not. When anxiety and fear become too intense and interferes with daily functioning, it is called an anxiety disorder, where imagination and emotions can play tricks on the mind works: emotions are triggered faster than logic reasoning and emotional learning and processing have a lasting effect on behavioral change. A person who has a spider phobia, for example, doesn’t need to see a huge tarantula to be anxious; the mere image of a spider, a movie about spiders or sometimes even just a black spot on the ceiling or the thought of seeing a spider is enough to create anxiety. The same reaction occurs with all the other phobias and anxiety disorders, whether its a fear of public speaking, agoraphobia or the fear of flying etc. When the brain’s center of emotions perceives something that is associated with threat, it automatically sets off an alarm reaction. Sometimes the alarm reaction is justified, sometimes it isn’t. Either way, this information gets to the center of emotions in 12 one-thousandths/sec. ; 7 one-thousandths/sec. faster than the time needed to get fully analysed through the center responsible for logical processing. Thus the fear reaction is extremely fast and can trigger emotions with wirtual stimuli. Phobic people are hypersensitive to certain details that sets off an irrational fear as soon as they are perceived, whether they are real or virtual. Virtual reality therefore allows us to recreate the essential features of a situation to trigger the fear reaction, at an acceptable therapeutic level, and thus allow patients to learn how to control it and encode in their emotional memory that the situation isn’t dangerous. 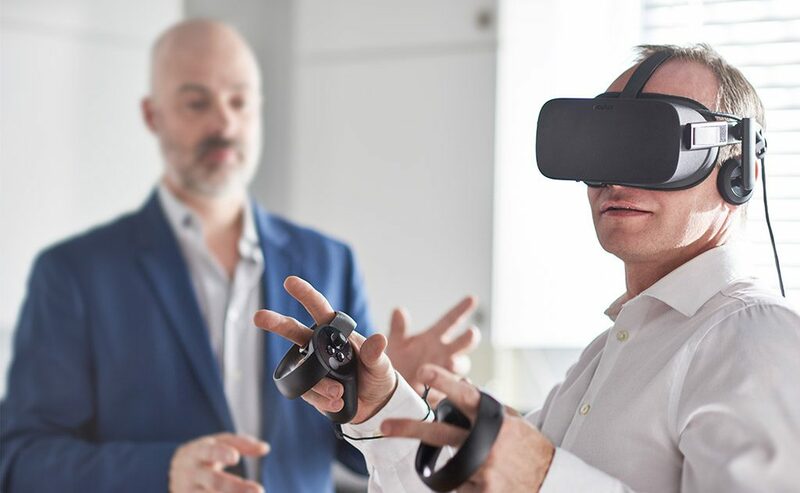 Studies have shown that the realism of virtual reality images seem less important than having the impression of being « there » inside the virtual environment, a phenomenon known as a « feeling of presence ». Virtual reality is a technology that allows a person to navigate within an artificial 3D environment in real time. 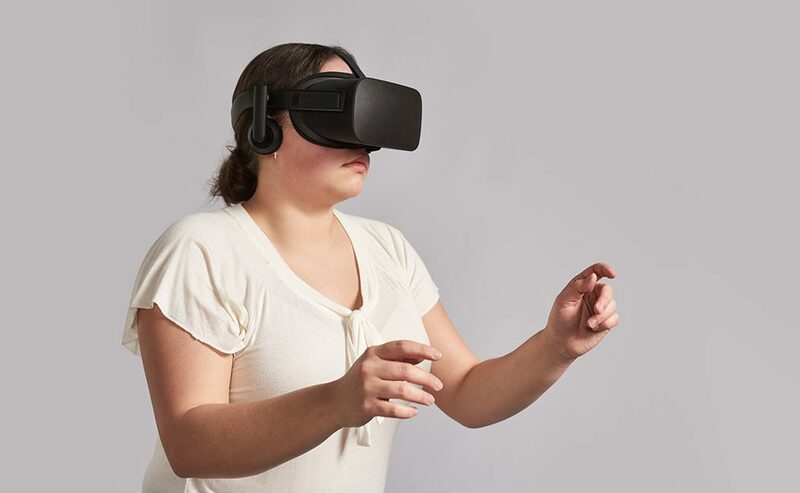 Wearing a headset with two built-in screens and a tracker, the user is immersed in a virtual environment and can undergo healing experiences. Want to know more about our exclusive products and services? Is there limits in using virtual reality in psychotherapy? The Limits of the potential of VR are still unknown! However, access to high-quality virtual environments is presently limited because of the costs related to their development. 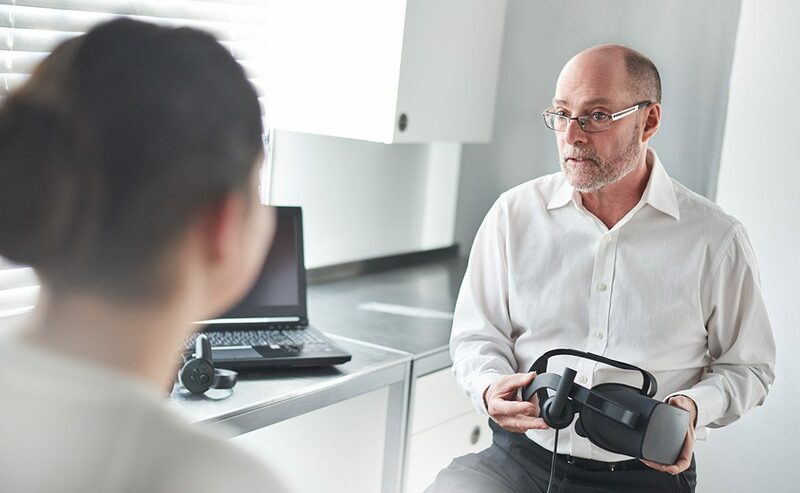 In Virtuo is working with the Canada research Chair in clinical cyberpsychology to create new therapeutic virtual environments and distribute them at lower costs. In Virtuo team believes that virtual reality is only a tool for psychotherapy and does not take away from the foundations of traditional therapy. Without knowledge and skilled professionals using this technology, virtual reality will not help making therapy more effective. According to Statistics Canada, 12% of the Canadian population suffers from an anxiety disorder at some point and this seriously reduces their quality of life. Two thirds of these individuals delay getting psychological help. Scientific studies have shown that people seem to be more attracted to virtual reality therapy to treat phobias than to traditional methods, especially because it feels safe, controlled and less threatening. In fact, psychologists are able to control situations that are usually unexpected.(e.g. spider’s behavior, climate, turbulence during an airplane flight, audience reaction during an oral presentation, etc.). Knowing that anxious individuals must sooner or later gradually confront their fears to eliminate anxiety symptoms, virtual reality is a way to artificially recreate situations that are difficult to access in the comfort of the therapist’s office. Consider, for example, fear of heights, where the therapist and patient need to go to very high places, or the fear of flying. Patients learn to master their anxiety, develop their confidence and change how they see the situation that frightens them, all done in a controlled and safe environment. 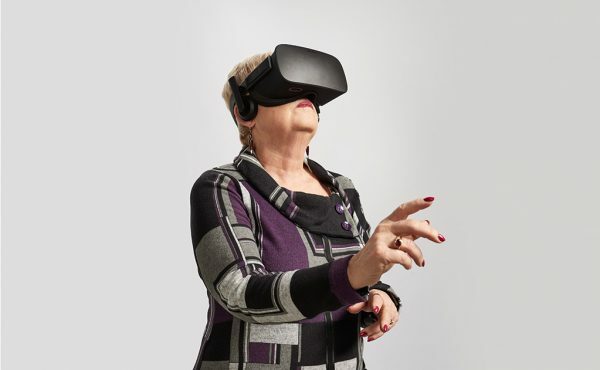 Virtual reality also allows the patient to repeat steps of exposure (e.g. airplane take-off or taking the elevator) as often as needed. Sometimes it can be very embarrassing to be afraid in front of others. Virtual reality allows the therapist to artificially recreate a variety of situations, enabling people to learn how to control their anxiety without having to go out in public. Some types of psychotherapy, such as fear of flying, may become even more expensive when the patients has to buy airplane tickets to expose themselves to their fear. Virtual reality allows the therapist to recreate these situations with a few clicks on the keyboard, without having to get out of the office.